The Deepwater Horizon oil spill in the Gulf of Mexico was the largest marine oil spill in the history of the petroleum industry. The spill caused extensive damage to marine and wildlife habitats as well as the Gulf’s fishing and tourism industries. Scientists are still reporting immense underwater plumes of dissolved oil not visible at the surface. Crews have been working to protect hundreds of miles of beaches along the northern Gulf coast, using skimmer ships, floating containment booms, and sand-filled barricades along shorelines. The US Government has named BP the responsible party, and officials have committed to holding the company accountable for all cleanup costs and other damage. In all respects a disaster for British Petroleum (NYSE: BP) – eleven lives lost, a disgraced CEO thrown out, and a very real threat of company bankruptcy. Despite all this – all the unknowns surrounding this stock – you could have made a quick 37% return by following a stock timing indicator discovered in the 1970’s. All the hopes and fears of traders is translated into one important item – price. 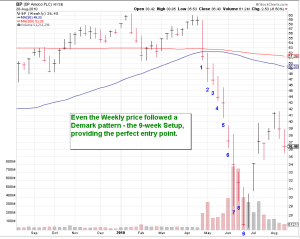 Tom Demark’s research in the 1970’s found that, prior to a price top or bottom, the market announces its intentions regarding price direction loud and clear to any trader willing to listen. Here’s the daily chart of BP stock since the Gulf oil spill occurred, with the TD Sequential Indicator shown. 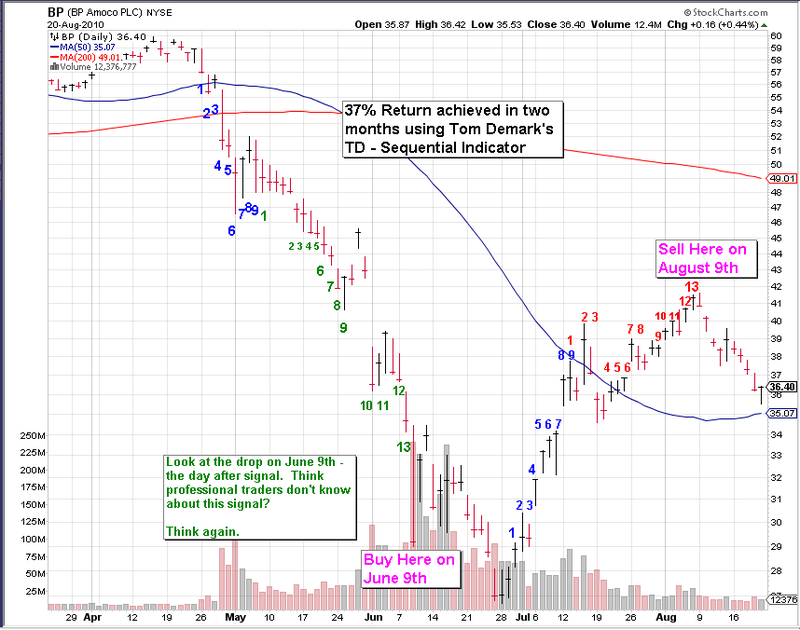 Traders achieved a 37% return in two months using the TD Sequential Indicator. I watched this trade unfold from the beginning, yet didn’t take it. 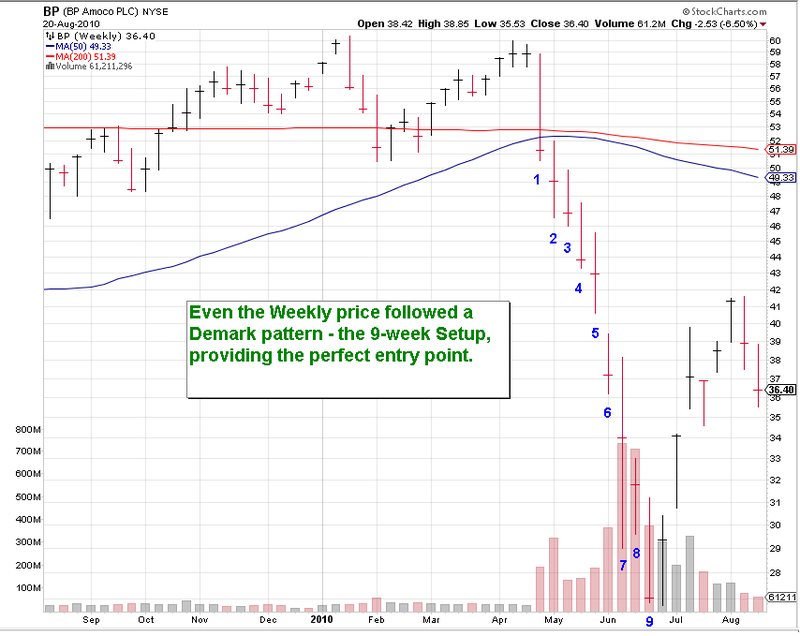 I really didn’t believe a fairly simple stock pattern, identified over 30 years ago, would show itself, given all the “unknowns” surrounding BP stock. However the more I learn about Demark patterns, the more I want a Bloomberg terminal so I can follow it easily – and bet the house. This site is a personal website where I record my own trading history and ideas – on investing mostly but other topics as well. Hope you enjoy.